Two years ago I decided it’d be a great idea to do a Christmas activity every day with the kids (thank you, Pinterest!). It didn’t matter that my husband worked full-time 2nd shift and went to school, I had two kids under 3, was preparing to travel for 6 weeks, and had started the month with a miscarriage. Bring on the crazy! Halfway through the month I began to stress, wondering if I was making Christmas “special enough” for the kids, if they had enough presents (I don’t even remember what we got them), and if we were making enough memories. On top of that I was feeling the guilt of not doing enough Jesus-y activities. I laughed. Because really it’s true. How can I “mess up” Christmas? Christmas isn’t about doing, it’s a state of being. It’s being secure in Christ–His sacrifice, joy, and love. If I have that at Christmastime and if I can give that security to my family, then I possess what no gift, Christmas craft, or candy can compete. It’s easy to get caught up in the many ways our culture celebrates Christmas. 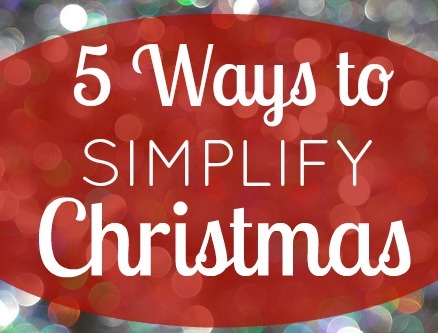 We can quickly begin to prize our traditions, gifts, and even our to do lists more than Christ. Don’t let “Jesus is the reason for the season” simply be a catch phrase that rolls off your lips. Intentionally set aside time to focus on Christ. What your family does may look different than what other families do, make your goal prizing Christ. Some ideas? Nightly lighting the advent wreath and reading a passage of Scripture, hanging Jesse Tree ornaments and reading the corresponding story, praying through The Divine Hours at Christmastide, an Advent devotional, or learning a new Advent or Christmas hymn each week. Celebrate Jesus–the joy, wonder, humility, love. Celebrate Jesus with your life–your holy sacrifice–all the year long. Often we celebrate the way we do because we’ve always done it that way. If you’re celebrating is characterized more by busyness and stress, then maybe it’s time to ask, Why you celebrate the way you do? It’s a simple question, but once you know you’re Why? you will be able to see if it is even what you want. We’ll really dive into this question in the next few days. Whether it’s Christmas gifts, parties, or desserts aim for a better experience over more. Perhaps give your spouse and children 1 or 2 gifts they’ll really love and will last, rather than filling the tree skirt with things they’ll forget 2 months from now. Plan to attend a select number of Christmas parties and events making a point to enjoy them and not simply mark your attendance. Or host an intimate gathering and spend quality time getting to know and loving on the people in your circle. Remember more isn’t always better. 4. What Do You Want for Christmas? What does your ideal Christmas season look like? What do you want it be? How can you make that happen? What is practical for your current season of life? 5. Focus on the joy—Christ first. 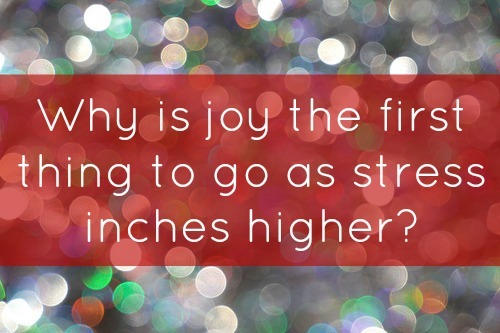 Why is it that joy is one of the first things to go as stress inches higher? Christ is our joy, our hope, and our peace. Without Christ-joy all celebration is superficial. Remind yourself of this over and over. I know I need it. Sing songs, write a list of thanks, journal, leave yourself notes, read Scripture and poems that direct your heart to Christ being your joy and satisfaction. Christmas doesn’t have to be stressful. It’s supposed to be a joy–-a gift! Jot down what you hope your Christmas will be like—think emotions, activities, memories, traditions you want to pass down, the “feel” of Christmas. Grab a piece of paper and write it down or share your Christmas hopes in the comments. Subscribe to the blog, so you don’t miss a post in the series. 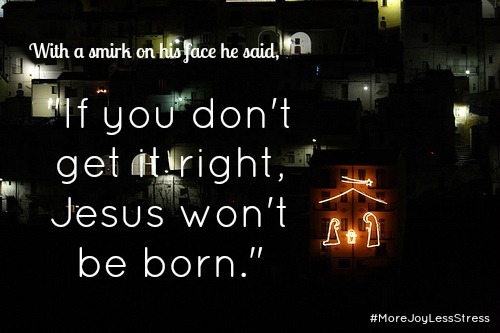 Follow along and share your Christmas plans and celebrations with the hashtag #MoreJoyLessStress on Twitter and Instagram. This. Only this. I am waiting for each post anxiously. I feel like I will be pinning every post to read every year to help me remember what is truly important! Loving this and cannot wait for more friend! Oh and to answer your question..I hope Christmas will be filled with Jesus (I can get so distracted by everything else…) and that more than anything my kids will think of Him and feel loved by Him and His gift and sacrifice when it is all said and done. I want them to know Him more.